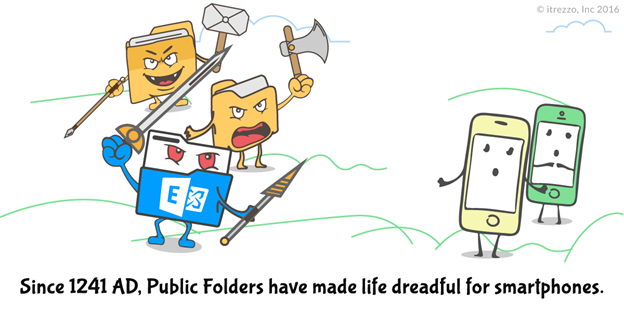 Home > Blog Articles > Do Public Folders Hate Smartphones? Do Public Folders Hate Smartphones? One of the common uses for Office 365 Server Public Folders is to manage company contacts and calendars. For example, if you work for a construction company and have a constantly changing cast of characters on projects, almost everyone in the company has an iPhone, Android or some other smartphone. Using an Exchange Public Folder to store up-to-date contact information and shared calendars is really easy. Maybe your company uses a preferred travel agency with multiple account contacts and phone numbers (a toll-free international number and an after-hours emergency line, for example). No problem—use a Public Folder. Got a list of contacts that’s only for your executive team? You guessed it…Public Folder. At some companies, they decide to completely abandon public folders. Write your own app. If you know how to do it, you could sync the Public Folder to the contacts folder on each mailbox. ActiveSync will automatically sync mailbox contacts to users’ mobile phones. Try CiraSync. This is my favorite way to sync smartphone to Office 365 public folders. So that’s it—the good, the bad, and the best ways to get the good without the bad. Hopefully, some of these ideas will be useful to you!